This Cafe Serves Only Healthy Meals With All Your Fitness Needs! Every year, you make a resolution to remain fit and fine and eat only healthy food but excuses like family lunch over the weekend, party hopping, junk food cravings, and all your plans to be in shape miss the track. This cafe will trick you into healthy eating with nutritional values pleasing your taste buds too. Check this out. 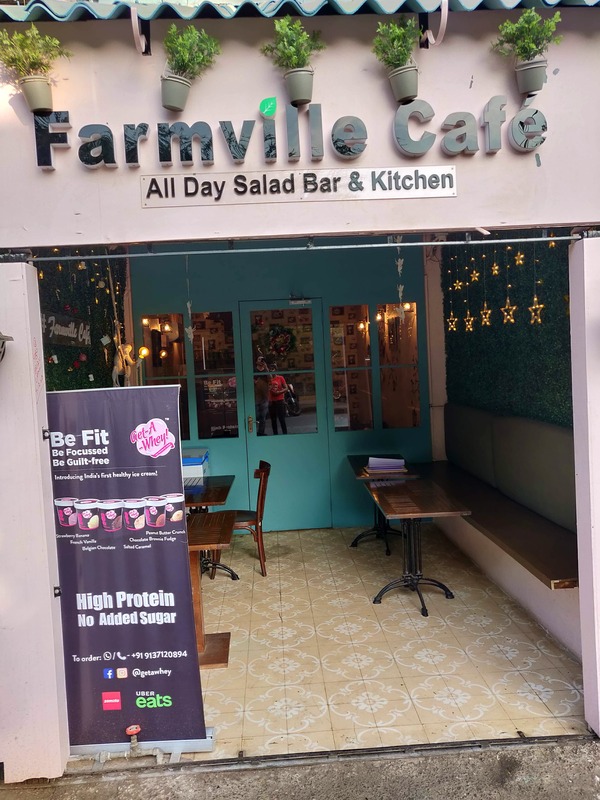 Farmville Cafe sits beautifully poised in the interiors of Juhu serving healthy and wholesome meals easy on your calorie quotient. One stop solution for all your fat-free and oil-free repast. The cafe is amicable in ambience with indoor and outdoor seating for around 15 to 20 maximum at a time. While the al fresco seating is for a casual experience, the indoor arrangements are for intimate conversations. Interiors are covered with hues of pink, butterflies, decals designs of trees with birds and cages. All such to make a good day with a good mood. Rohit Sharma – a television actor by profession and a fitness geek decided to venture into fitness cafe to break the stereotype & spread awareness that healthy food is tasty too. Supporting him in this pursuit is Sonia who happens to be one of the partners at Farmville Cafe. Skimming through the menu, you will realize it contains more of vitamins and proteins oriented stuff that acts as a refuel to your body, stomach and mind. If its 2 pm and you missed the breakfast, try their All Day Breakfast with options like Avacado Toast With Sesame Seeds, Egg Benedict, Baked Beans, Sauteed Mushroom etc. which is more than enough to suffice you. They have awesome Teas and Coffees served throughout the day. Start on an easy note with White Quinoa Salad looking colourful and mouth-watering with kale, spinach, raisins, pomegranate & walnuts. To up your spirit, order the Southern Fried Chicken Tenders tasting delish with crispy chicken. If you intend to increase your protein intake, then Basil Grilled Chicken with sauteed seasonal veggies and sweet potato mash is the best option. Tacos are generally over-filled with beans but do try the light version of Chicken Tacos loaded with cabbage slaw, fresca and secret sauce. You will get bowled over to smoothie blends when a Smoothie Bowl of strawberry, pineapple & banana is kept in front of you and still not heavy on eating. From fresh juices, you can pick Anti-Aging & Vitamin C juice made up of carrot, apple, pineapple, beetroot, ginger and lemon. They have a special Belgian Chocolate Ice-cream made up of Whey proteins and it’s a definite success. So healthy food is not always bland and spicy food are never healthy. If you wish you have a great beginning then head to this cafe with your friends, family and tell them the importance of being healthy in 2019.